An indoor air cleaner should match the scope of the problem it is purchased to solve, and the size of the room to be cleaned. The first step toward clean air is the removal of toxic sources from the interior of the home. Many people are unaware of the extent and complexity of the threat. You wouldn't believe how many folks buy or lease property only to discover they are trapped in a haunted house. Then they email me asking for an air cleaner recommendation for their indoor air nightmare on Elm street. I know most readers are too young to remember pop music from the 1950's but I can't help being reminded of this ditty. I knew I'd moved in a haunted house"
Actually, many people think air pollution applies to outdoor air only. EPA has found indoor air with pollutants up to 70 times as concentrated. While installing an air cleaner indoors is recommended, understanding the issues involved will boost success. We spend 90% of our lives indoors, where we tend to feel safe. We have only limited control over air pollution in public, but our home is our castle, right? Our castle air is haunted by unclean ghosts from the past. Many homes have residential indoor air purity worse than the average industrial site. Even though we have cleaned regularly for years; we don’t remove the register plate and look in air conditioning ducts, behind the fridge, or in the crack between the stove and cabinets. More importantly, it’s what we couldn’t see even if we did look which is destroying our health. A typical home contains over 60 toxic chemicals in addition to pollen, mold spores, cat dander, and very diverse house dust. Before installing an air purifier, indoor air pollution sources should be removed. Ironically, some of the worst toxic offenders come from cleaning products. Dry-cleaned clothes hanging neatly in closets are a big source of pollution in the all-important bedroom. An EPA study concluded that toxic chemicals in household cleaners are 3 times more likely to cause tumors than outdoor air. Household cleaners are the principal cause of toxic ingestion by children. The smallest dust particles pass right through ordinary vacuum cleaners. The normal canister vac, even the "HEPA" kind, needs an air purifier of its own to clean the cloud of invisible particles in it's exhaust. Please do not empty the vac indoors. When these are dumped in the wastebasket, millions of fine particles are released into the air indoors. 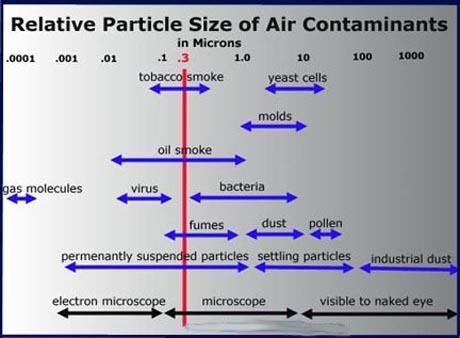 99% of the millions of airborne particles in one cubic foot of indoor air are smaller than the 20-35 micron size visible to the naked human eye. A micron is one millionth of a meter, 39 millionths of an inch. A grain of salt is about 60 microns, human hair is 100 microns in diameter, and human cell is typically several microns across. Tiny particles, the same ones which penetrate deepest into our lungs, are real villains in the indoor air quality story. They float in the air, rarely falling where we could vacuum or sweep them up. Air movement keeps them suspended; footsteps across the carpet, the furnace or A/C blower, and natural convection currents (warm air rising and cold air sinking). These pipsqueaks are measured in tenths of a micron. In the indoor air cleaner industry, true-HEPA air purifiers are judged by their ability to remove .3 micron particles. This is the most penetrating particle size. But only true-HEPA filters, tightly gasketed and sealed, will effectively trap fine particles. .3m is just below the level where low priced mass market big box department store air purifiers, designed to let some air slip past the filter to assure motor cooling when filters are clogged, come up short. Some of these "bargains" will let all particles smaller than 2.0 microns through. Uninformed consumers continue to buy this junk, marveling at all the coarse dust that builds up on the filter. This does not mean good HEPA air purifiers cannot capture smaller particles. But the finer particles may slip around cheaper machines without tight gaskets and sealing. Cat dander and dust mite droppings go down as fine as .1m. Now I really am afraid of black cats! Smog and cigarette smoke have particles that are as small as 0.01m. When the largest particulates have been removed by average air purifiers, indoor air will appear to have been cleaned. Appearances deceive, as gas toxins and fine particulates we cannot see remain airborne. Again, three tenths of a micron is the HEPA "most penetrating particle" size, smaller particles are considered to lack the weight to break through. Many vendors, and even a few manufacturers, misrepresent the HEPA spec. "As small as .3 micron," "down to .3 micron," and other quotes are incorrect. HEPAs are tested at .3 micron, but decent ones will clean all particle sizes with some percentage efficiency. However, many lower quality "HEPA" air cleaners, and almost all electrostatics, and every single "HEPA-TYPE" filter, will let the smaller particles through. This is why air cleaner bypassing is dangerous: smaller particles can fit through cracks in filters or poor fitting casings. Also note that almost all the health hazards, other than pollens, are below the black bar in the lower right corner marked "visible to naked eye." "Made a noise with it's feet, sounded just like drums, said You won't be here when the morning comes"
Lungs, made of thin membranes, are easily damaged by pollutants in the air. This increases the risk of asthma and allergies, chronic bronchitis, lung and other respiratory diseases. Lung disease causes 335,000 deaths annually and is the third leading cause in the United States. In the last twenty years, as energy efficient sealed homes have become the norm, the mortality rate for lung disease has risen faster than for almost any other major disease. Since 1980, asthma has increased by 600%. Over 20 million Americans suffer from asthma triggered by pollutants such as dust, smoke, mold, and fungi. Malignancy rates have nearly doubled since 1960, becoming the number one cause of mortality in children. Women who work indoors are at a 54% higher risk. With a 26% increase since 1982, breast malignancy is the number one killer of women between the ages of 35 and 54. Household cleaners and cosmetics are among suspected triggers commonly found in indoor air. Poor indoor air quality can cause nasal congestion, dry eyes, nausea, headaches and fatigue. Some health problems point to a pollutant in the air that an indoor air purifier may not resolve. This is especially true where new construction, fresh remodeling, new carpet, or pesticide application precedes symptoms. There are 3 principal categories of indoor air quality contaminants; particles, gaseous volatile organic compounds (VOC) and biological threats. The largest single particle source in most homes is human skin flakes. These nourish dust mites and mold, slowly decaying in carpet and cracks - a continuous source emission. Fibers emanate from favorite furniture, upholstery, drapes, or carpets. The lint screen of my clothes dryer is full after a couple loads, but the fabrics in clothes, towels, and linens continue to shed lint throughout the house. Synthetics like rayon, nylon, and polyester shed toxic particles. Even natural fabrics like wool and cotton often contain dyes and additives. Before the 1970s, many building products and insulation contained asbestos, a mineral fiber identifiable only with a special type of microscope. Asbestos is linked to lung neoplasms, mesothelioma, and asbestosis. Many ventilation systems have exposed fiberglass in the air stream. Airborne lead particles flake off from lead based paint. Mercury comes from latex paint. Particles build up in heating ducts, fabric covered furniture, and carpet. Children's stuffed animals can accumulate dust and dust mites. Wait till you see this next batch of spooks. Nothing I know gonna drive me away"
Designed for gas transfer, our lungs cannot prevent toxic gasses from entering the bloodstream. We often cannot smell the invisible toxic VOC in the air inside our homes. These vapors waft about on air currents like ghosts in an early horror film. Volatile Organic Compounds (VOC) vaporize at room temperature. Other toxins may vaporize when a particle, maybe nylon, lands on a hot surface, such as a light bulb. Fumes evaporate from cleaners, paints, solvents, and pesticides. Combustion products, including dangerous carbon monoxide, emanate from stoves, cigarettes, fireplaces, heaters, and furnaces. Cleaning fluids kept under the sink. Dish washing and laundry detergents, aerosol fresheners, and hairspray leave toxic vapors. Many are dangerous hormone disruptors: "Xenoestrogens." Candles, incense, and oil lamps also produce gasses and particles we cannot see, and leave residues nearly impossible to clean. Candle Soot Damage details dangers of routine candle use indoors. Everyone has heard about second hand smoke, but researchers are finding proof of what chemical sensitives have always known: there are lingering residues in living spaces even after tobacco smoking has stopped. Bleach vapors may contribute to rising rates of breast tumors, reproductive problems in men, and behavioral problems in children. Radon, a radioactive gas occurring naturally in soil, is a known cause of lung neoplasms. Formaldehyde is used to bond plywood, particleboard, carpets and fabrics. Every year I receive eMails from folks whose entire families have "suddenly" become ill with similar afflictions, usually sinusitis. The first thing I do is go to Google earth and look at satellite photos of their location. Often it's a mobile home park, and they just a bought a "pristine" brand new trailer. Everybody has heard of the "new car smell" from outgassing solvents, plastics, and glues used in auto construction. Most new homes, especially factory-builts, outgass almost as bad. Carpet cleaners and dry cleaning release solvents into our air. Even carbon dioxide, which we exhale, builds up without adequate ventilation. Microorganisms inhabit our homes; molds, bacteria, viruses, and dust mites. Dust mite droppings, pet dander, and hair fragments settle deep into carpeting, which resists all efforts at cleaning. Cockroaches leave decaying body parts which trigger allergic rhinitis and asthma. Heating and cooling systems are often sources of biological threats requiring indoor air purifying. Micro-organisms are the future, and technology is evolving to combat their spread. These indoor threats to our health are real, especially to those who stay inside all day - work-at-homers like me, children, and the sick or elderly. When we understand our adversary, a complete home improvement and purification strategy will evolve. A quality air purifier is an important part of that strategy, but no indoor air cleaning system can work without source removal and ventilation. We control the air quality inside our homes! Let’s arm ourselves with information and run these spooks off. Ain't no haint gonna run me off." You can browse Air Purifiers at Amazon.com.